He may not have been a purveyor of excellence when it came to producing, but Sam Katzman was prolific (238 films as producer) and he always seemed to have his finger on the pulse of the times, knowing exactly what the viewing public wanted. 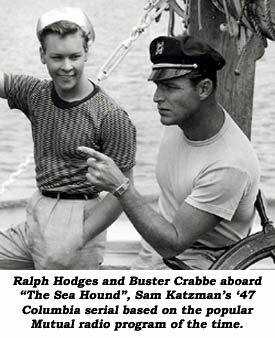 Born July 7, 1901, in New York City, at 13 Sam entered the film industry at the old Fox Studios as a prop boy. From 1914 to 1933 he worked his way up the ladder, serving as everything from prop boy to production manager at firms like First National, Cosmopolitan and Showmen’s Pictures. 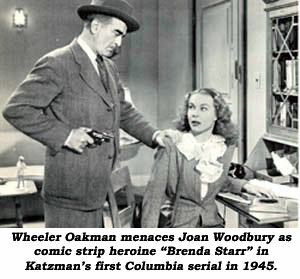 By ‘34 Sam was supervising producer for A. W. Hackel on a series of Bob Steele westerns released by Supreme. 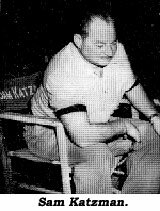 Having seen the profits to be made on Poverty Row, Katzman arranged to obtain the Bryan Foy studios in Culver City, CA, where he formed his own Victory Pictures in mid 1935 and began producing westerns, action thrillers—and serials. Through January of 1940, Victory turned out 30 feature films (many with Tom Tyler and Tim McCoy) and two serials, “Shadow of Chinatown” and “Blake of Scotland Yard”. Olympic decathlon champion Herman Brix (later Bruce Bennett), who had starred in “The New Adventures of Tarzan” (‘35), was hired by Sam to star in five features and the 15 chapter serial, “Shadow of Chinatown” (‘36), also with Bela Lugosi. 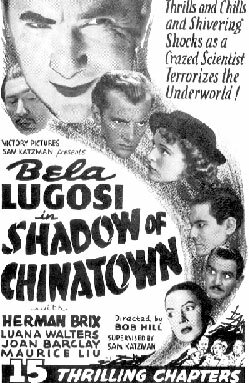 Compared to what Republic and Universal offered, “Shadow of Chinatown” was an embarrassment. Sam spent nearly all his budget on Lugosi, Brix and Joan Barclay, leaving little for production values. “Shadow…” had a complicated plot, moved slowly and was light on action. Sam maximized his profits by editing the serial into a feature as well. Sam and director Bob Hill picked up the pace dramatically with their second serial, Blake of Scotland Yard” (‘37) which starred Ralph Byrd, Herbert Rawlinson, Joan Barclay and Dickie Jones. It was an out-and-out action-packed mixture of atmospheric horror, mystery and science fiction. It too was released in a feature version. With the cessation of Sam’s Tim McCoy series, Victory closed its doors and Sam went over to Monogram where, from ‘40-‘47, he produced more than three dozen B-pictures starring The East Side Kids, Bela Lugosi and The Teen Agers. 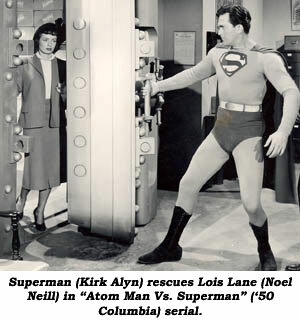 No more serials til ‘45 when he began to also work for Columbia, whom he joined exclusively in ‘47. Columbia then dismissed producer Rudolph C. Flothow and made Sam their sole serial producer. 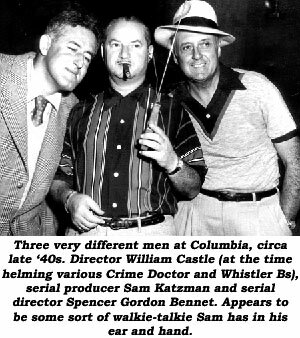 From ‘45 through the end of the serial era in ‘56, Sam produced 32 serials for Columbia. Not only did Sam use many of the same leads over and over, he also relied on a “stock” company of supporting actors, dependable heavies and character people like Jack Ingram, Charlie King, Rusty Wescoatt, John Merton, Zon Murray, Terry Frost, Jim Diehl, Eddie Parker, Leonard Penn, I. Stanford Jolley, Frank Ellis, John Hart, Hugh Prosser, Rick Vallin, Gene Roth, Wheeler Oakman, Robert Barron, Pierce Lyden, William Fawcett, Pierre Watkin, Nelson Leigh, Anthony Warde, Don Harvey, Stanley Price, Marshall Reed, Charles Quigley, Bud Osborne, Ralph Hodges, Nick Stuart, Lee Roberts, Tommy Farrell and others. 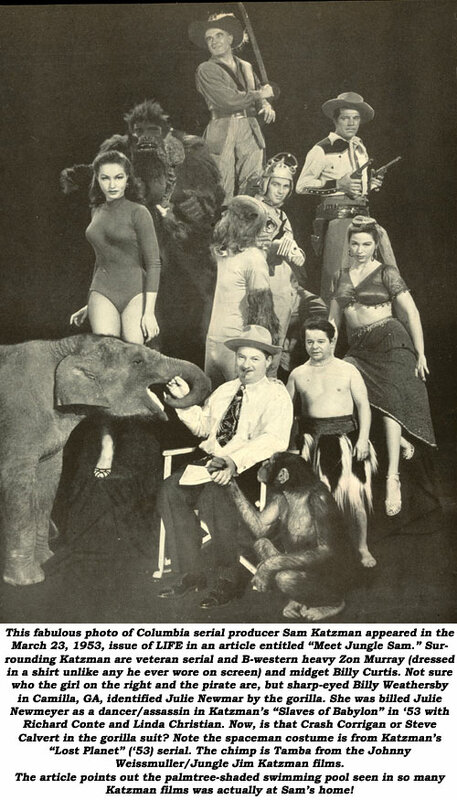 The ‘50s and ‘60s saw Sam making Jungle Jim, western, sci-fi and teenage musicals for Columbia, juvenile delinquent films for Columbia and AIP, even Elvis Presley musicals at MGM. Katzman had a way of catching the wave of a fad and grinding out a film before it faded away. The legendary “Jungle Sam” Katzman died August 4, 1973, at 72. At the end of Ch. 12 of “Hop Harrigan”, young Buzz Henry, flying out of a deep canyon, hits the edge of the mountain with the plane’s wings and dramatically cartwheels the plane! But wait—at the start of Ch. 13 none of the terrible crash happens at all! Buzz simply flies out of the canyon! In Ch. 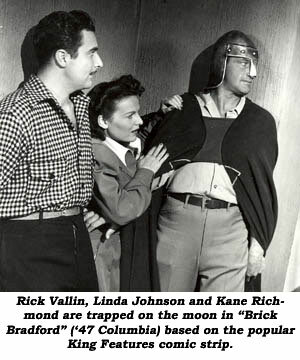 14 of “Lost Planet”, evil Dr. Grood sends a Cosmo Jet with a Neutron Detonator aboard to ram the atomic plane in which Rex Barrow (Judd Holdren) and Darl (Nick Stuart) are returning to planet Ergro. They collide. However, in Ch. 15, Rex diverts the atomic plane before the Cosmo Jet explodes and they never collide. At the cliffhanger of Ch. 8 of “Blackhawk”, a flying disc crashes into Blackhawk’s plane. But, in the Ch. 9 resolution, Blackhawk shoots the disc out of the sky, exploding it before the disc strikes their plane. In Ch. 2 of “Son of the Guardsman”, after surviving a river crossing, in the middle of the woods Robert Shaw magically acquires a bow and quiver of arrows he didn’t previously have.